It has the torque but doesn't have the speed. I instaled it on an SC10B. 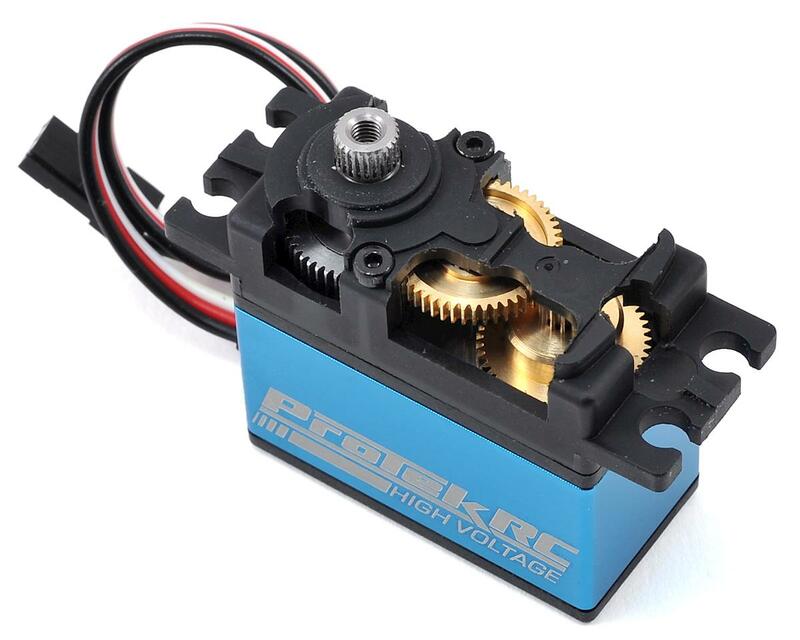 It is a good servo for the price and if you are not planning to use it for racing. bought this with the plans of installing in my 8.2e when its aging savox finally went. as is the case with r/c the servo in my 10-scte went first. so I put the 100t in that truck. simply put, this servo is amazing! it has the power and speed to put my truck wherever I want even under loads of landing big jumps into corners on outdoor tracks. indoors it just laughs at whatever I can throw at it. putting one in my proline pro2sc next. may be a little overkill on a lighter car like that but better to have more and not need it than not enough. haven't experienced any glitching but I use it with an rx8g2 those seem to rarely glitch. I would highly recommend this product! 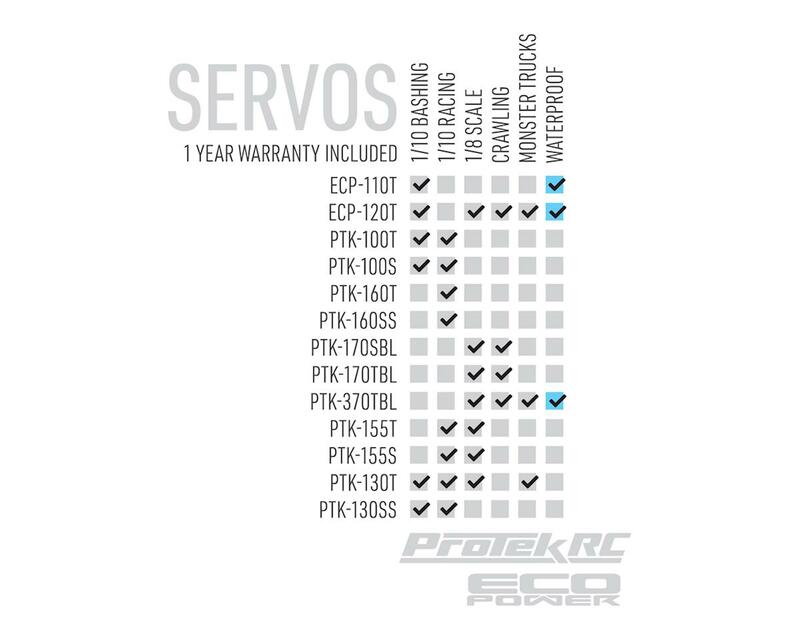 Purchase this for a Gmade R1 Crawler and this servo has plenty of TQ to turn the big 2.2 wheels on any surface. This is a great servo for the price. The only down side it does not come with a servo horn but all in all I am very happy with the purchase and I would recommend it. This has been a great servo for my Associated B4.2. 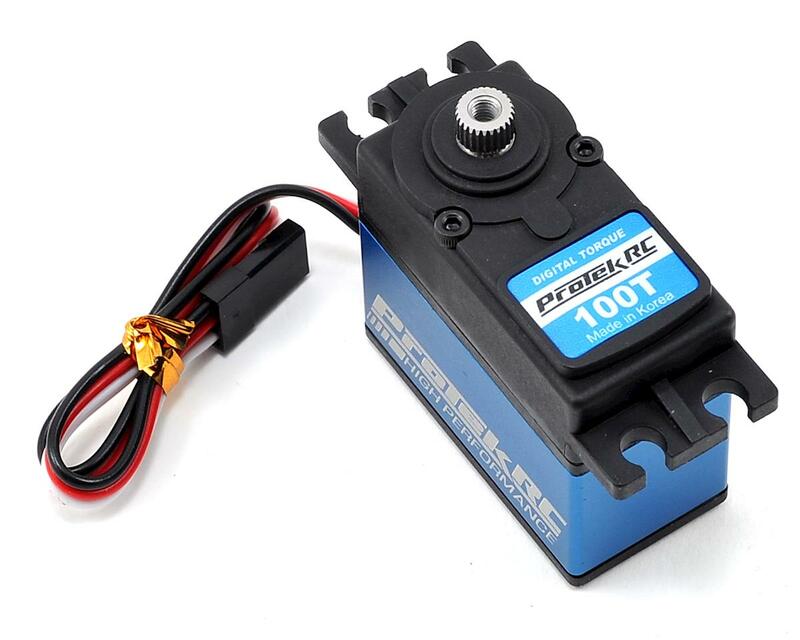 It has plenty of torque and good speed, and is definitely a good upgrade from any stock servo, especially for the price. Planning to run this in my SC10 and RC8 for steering. I run the 100SS for throttle in my RC8 and that has been great, too. This is a great servo! Plenty of torque and speed for a 1/8 buggy to run on virtually any environment. One of the best deals that you will find on the market. Mine has five plus gallons on it, and have not had a single issue. Great servo for the guy on a budget and getting into racing and bashing. They get the job done. Not the fastest or most powerful but they aren't noisy and are reliable. Running on my scx10.2 with small 1.9 and tall 1.55 tires. It get the job done. No issue yet. I would buy it again for tiny tired trucks. 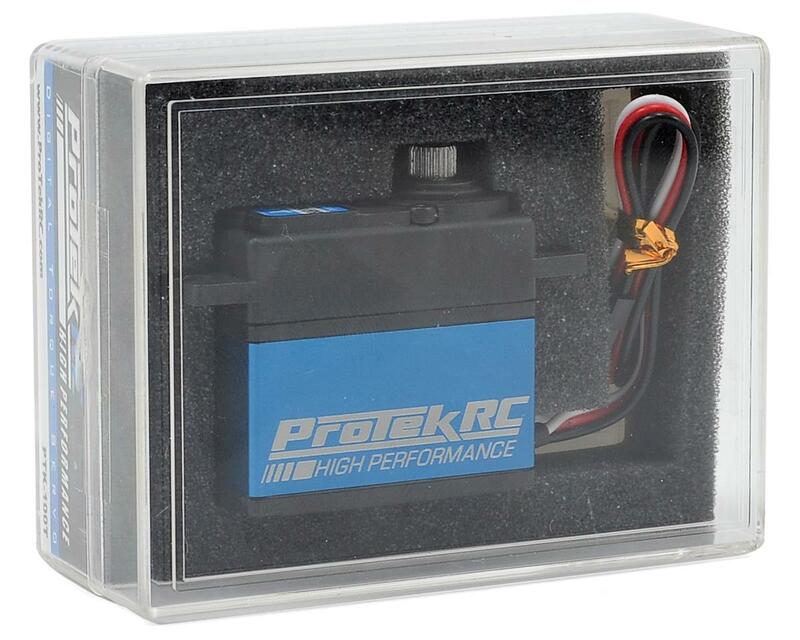 very good servo , use on my losi 2.0 nitro , was going to use is for throttle / brake , but with my current budget had to use it for steering servo temporarily , I will keep it for steering because it really seams to work well , i think with nitro where you have some lag time with an engine it really works , cant say weather or not it would work well with brushless truggy / buggy . I use all HV 350 + oz/in - less than .10 @ 60 degrees for brushless . I will try it next time i blow a servo on brushless and let you know , CHEERS! I didn't have as much luck with this servo but I think that was due to it being installed without a BEC. I will, however, give Amain an A+ on customer services as they not only replaced it but upgraded it for me to a 170T which is why it's getting 5 stars! I believe that if I had installed it correctly the first time, my gripes would've been solved. I had to make a servo purchase for my ECX Torment 2wd short course truck, and this was the best option my local race track had. I was hoping for a higher speed servo, but this one has done a fantastic job. 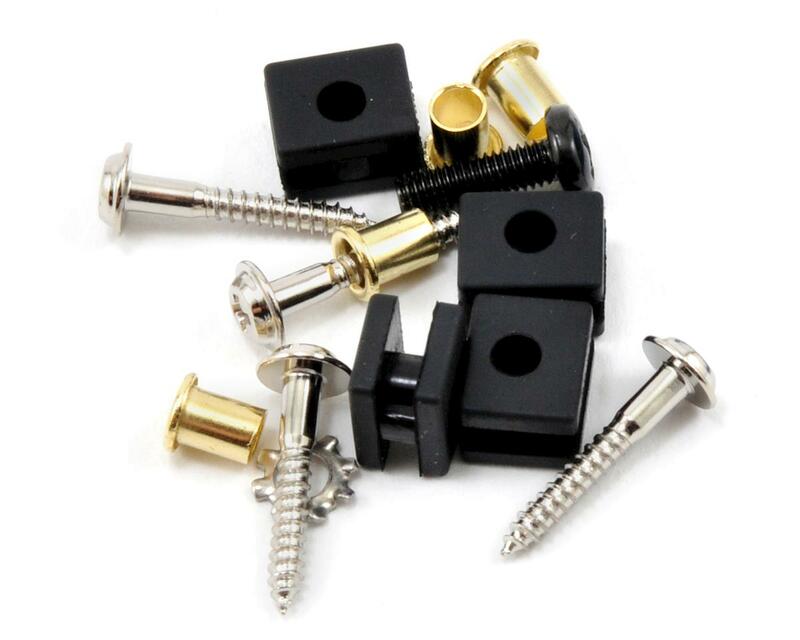 The fit and finish are great, I've had zero glitch with it, and wouldn't hesitate to recommend it. I don't know that I would use it in a buggy, I run a Savox 1258 in mine, but for the bigger wheels and tires of a truck, the extra torque really shines. 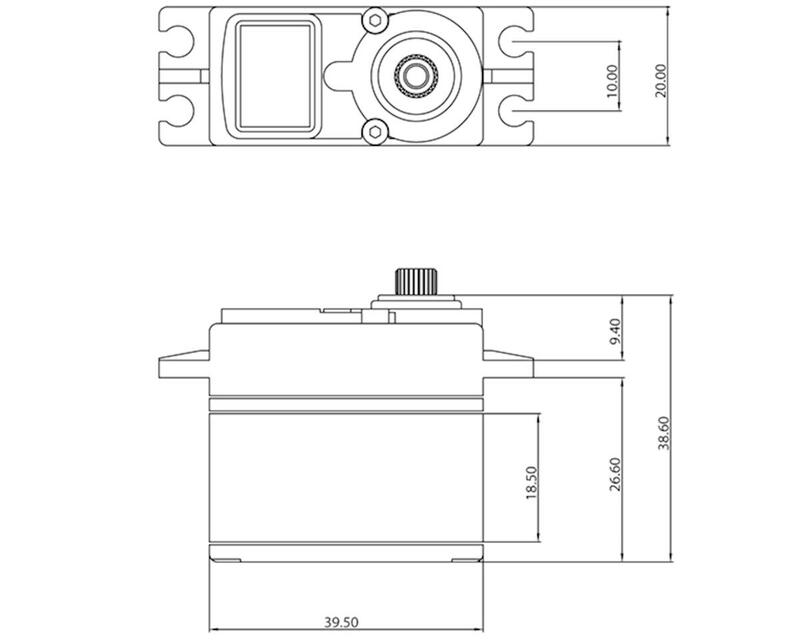 Great servo, very high quality. Great torque, great speed, great value. Has no problems turning the huge tires on my MT4 G3. Would highly recommend for bashers and racers alike! I bought this with recommendation from a friend who runs these servos in all his vehicles (either high torque or high speed versions). Replaced the Traxxas 2075 servo with this on my Slash Platinum 4x4 with newer LCG chassis conversion. This servo has been trouble free and the anodized finish makes it look pricey. No glitches or weird noises - just clean operation. I use a Losi servo horn (futaba toothed) to tie things together. Other than my Futaba R2004GF receiver, the truck is stock. Oh, and a roll cage from VG Racing which brings the running weight to 6.5 lbs. Seems to be a nice quality piece. A little glitchy with a factory Traxxas receiver, but a capacitor solves that. Good piece for the money. Ok after several months of using this servo, the 100t, and the 100ss. I find they have glitch issues. I would not buy again, however, I will say that A Main has the best customer service in RC. They assured me the issues are being detailed and corrected right now. Thanks a bunch A Main. Purchased two of these. Put one in my Associated B4.1 and the other in my Associated SC10 short course buggy. Has been an outstanding, affordable servo for both of these vehicles. Let me start by saying I am a big fan of ProTek products. I have the PTK-130T in my 44.3 and the 150T in my 8ight 3.0 and they work flawlessly. However, I bought 2 of these expecting similar quality and was severely disappointed. The do work but you can hear these bad boys from 20 feet away. My recommendation is to step up to the 130T.